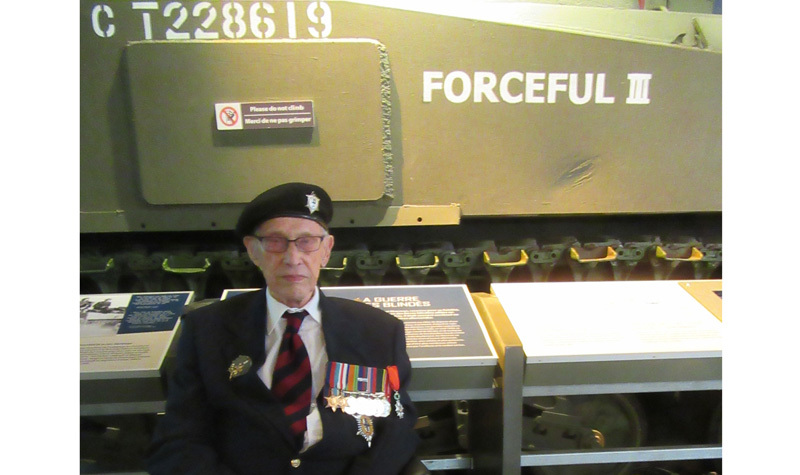 Forest Hill resident Marty Joiner is seen here with the tank he rode in during the Second World War, Forceful III, at the Canadian War Museum. A Sept. 29 outing to the Canadian War Museum in Ottawa was a trip back in time for Marcel “Marty” Joiner, the Forest Hill resident says. 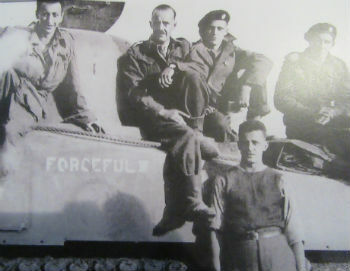 Marty Joiner, pictured top row, second from right, is pictured with his company along with their tank, Forceful III, during the Second World War. At the museum, Marty, who served as a gunner in the Canadian Army during the Second World War, got to see the M4A4 Sherman tank he trained in and fought in during the army’s advance from France into Germany in 1944 and 1945. The tank, called Forceful III, was literally his home for part of his six-year service in the war, Marty says. Marty, who’s now 95, is the last surviving member of his regiment. He recalls how days spent in the tank could be tense. The sound of gunfire was nearly constant some days as the tank made its way across northwestern Europe, he says. The Forceful III, which was operated by the Governor General’s Foot Guards, was the regiment’s only tank issued before D-Day – June 6, 1944 – to fight through France, Belgium, the Netherlands and Germany without being put out of action, according to Preservedtanks.com, a website providing information about historic armoured vehicles. Marty has lived at Forest Hill for about four months. When Craig Forrest, the Kanata long-term care home’s life enrichment co-ordinator, learned the same tank Marty had fought in during the war was at the museum, he got the idea to organize a day trip for Marty and other residents. “After he moved in I was talking to Marty and he had told me that the tank he rode in was at the war museum, so right away I just thought that would make a perfect outing,” Craig says.